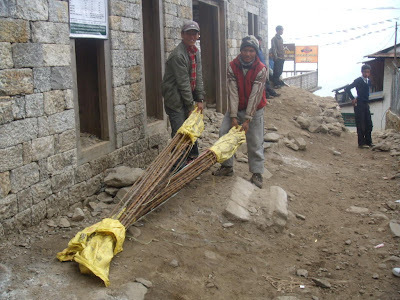 HELPS THE SHERPA PEOPLE IN NEPAL. WE ARE BUILDING A BIO-CLIMATIC TOURIST LODGE. 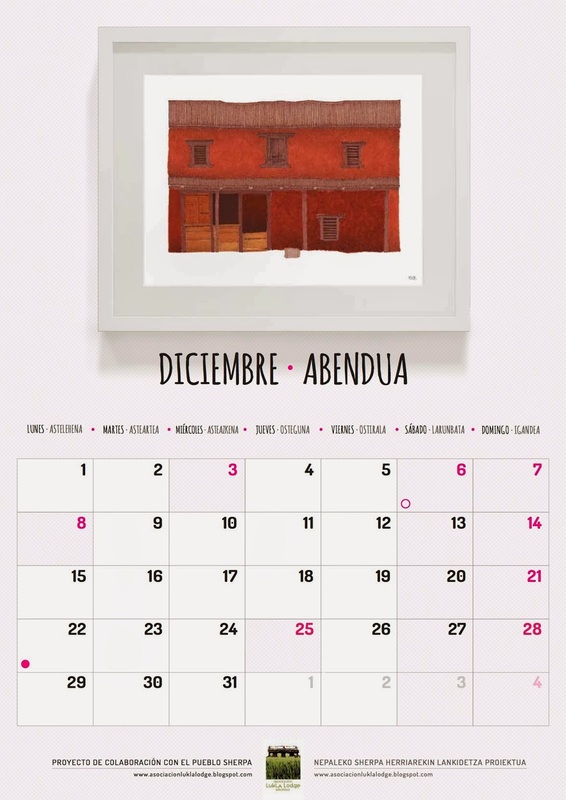 Para ello os pedimos la máxima difusión de los calendarios ya que ahora es, prácticamente, la única fuente de financiación. 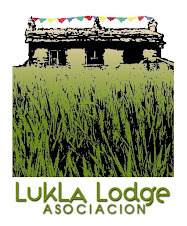 The Lukla Lodge Association was created three years ago and its purpose was to build a lodge in the "door to the Himalaya", in the town of Lukla, where the famous mountain airport arrive the vast majority of trekkers and tourists that want to see Everest or Sagarmatha ("head of the skies" in nepalese), and its 8.848 m of altitude. 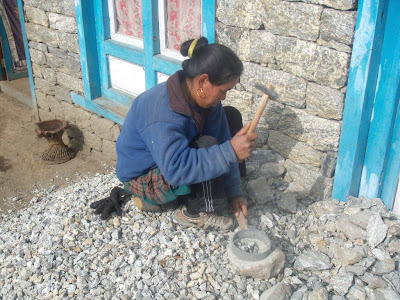 Dawa Pasang Sherpa, who will run the future lodge, is a 38 year old woman with two teen age boys, separated from her ex-husband because of serious problems in their coexistence and with very little economic means. Her only personal property is the plot of land where we are building. FOURTH.- Miss Dawa Pasang Sherpa will colaborate in the social promotion of all activities, courses, talks, conferences, etc...related with literacy campaigns, healthiness, bioclimate construction, alternative energies, women's autonomy, English, training for porters and sirdars, and any other activities that the Association might program. FIFTH.- Miss Dawa Pasang Sherpa, likewise her ancestors, descendents and heirs will not be able to alienate, rent, donate, transfer, hand over the use of her plot of land, which is the subject of these agreements, without the expressed consent of the Lukla Lodge Association, who will have a right of first refusal over this land, whichever the reason may be and the title of the transnission to third parties. We encourage all collaborators to become members, understanding as collaborator any person that has made a donation, for which an ID card and address are necessary. The board of members is made up by four people and they get together periodically: Raquel Bueno, Ana Armendáriz, Lucía Lorda and Koldo Aldaz. Raquel and Koldo control the Association and the expenses that are made. 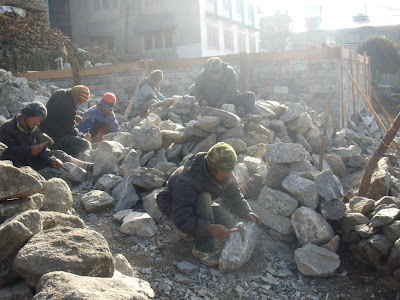 There are NO management expenses at all made by the Association and every euro that comes into the account goes directly to Nepal for the lodge construction. 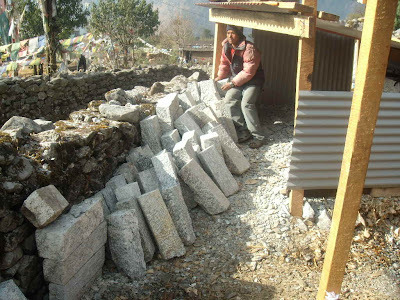 Our support administrator in Nepal is Mikel Leizeaga, a basque that formed his family in Kathmandu and to who we owe a great deal of all the effort that has been put into this project. 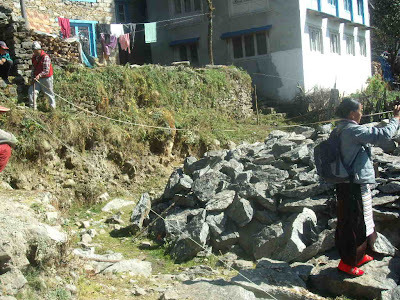 As soon as the construction is completetly finished and we go to inaugurate it, which we calculate will be around autumn 2011, the local development activities that we have mentioned above, will start. As a consequence of the usual budget deviation in every building work, we have at present a 14.000€ deficit, which we have temporarily solved through a loan that we have to return as soon as possible. We prefer doing it like this than leaving all the building work unfinished and the perspective of a hard winter ahead and the later difficulty of finding other building contractors. SO WE ENCOURAGE YOU TO MAKE DONATIONS EITHER DIRECTLY MAKING A PAYMENT INTO OUR ASSOCIATION ACCOUNT IN THE U.S.A. (TRI-COUNTY BANK, ACC # 474390, Routing Number: 072404977) OR DIRECT DONATIONS WITH THE "DONATE" BUTTON IN THIS SAME BLOG, through Pay Pal by completing the following form with basic data and without registering in Pay Pal if you don't wish to. 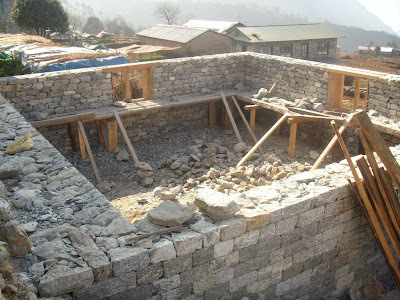 WE NEED FINANCIAL HELP IN ORDER TO FINISH THE STRUCTURE: Lukla Lodge Association account number in U.S.A.
We are already finishing the structure of the lodge! It seemed a dream that would never come true but it's a reality already, thanks to all of you. We are very excited with this project that started one autumn three years ago, when Dawa Pasang, the person that will be in charge of the lodge, told us about this little piece of land she owns and she could do nothing with it but sell it at a loss. This is only the beginning, as you all well know. It's a a very important stage because all this quiet and very little eye-catching teamwork like paperwork (thank you Mikel), technical project (thank you Ramon), search for all the materials -which is very complicated up there- and, above all, raising funds...all this quiet work is now giving its rewards and nowadays this is one of the best constructions in Lukla. And it's only the beginning because first, we need to collect the necessary funds to finish the roof and second, funds to finish the interiors, through direct personal contributions and banks or organizations. We encourage you from here to contribute within your own possibilities (any amount is well received) and to help us spread this project among your friends so that very soon we can all go and inaugurate the "best lodeg in Lukla"! 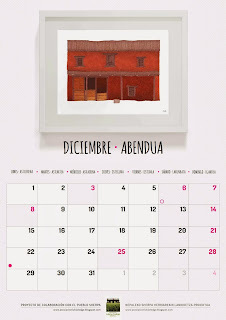 Danyebad, Eskerrik asko, Moltes gracies, Thank you, Merci beaucoup, Dankeschön. SPREAD THIS INITIATIVE, AND TAKE PART IN OUR PROJECT!! There are people who would like to help in making our world better, but also people that are capable of doing this. Could you want to be one of them? Help this interesting project, by spreading it to all your friends or by an economic contribution. Together we can, more infinetly than separately! Thank you!! Don't forget to put your name and we will send you an email in order to keep you informed of everything.